Nowadays, the short film feature has achieved extreme prominence as short infomercials and promos in social media while being neglected and forgotten when they are screened in moviehouses. It seems netizens have forgotten that cinema as we now know it originated from short film features. 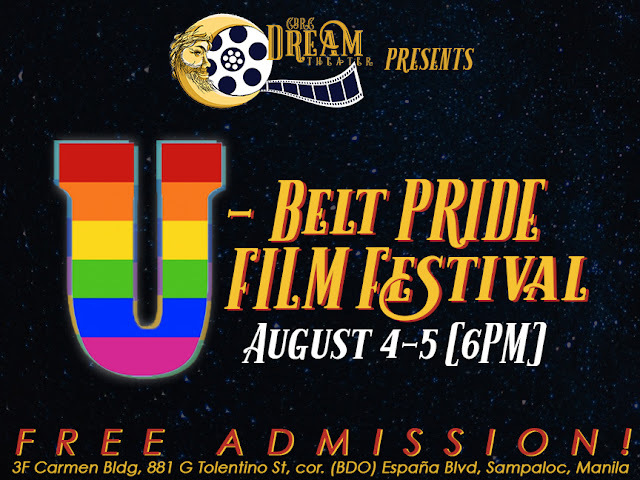 And while it has screened numerous feature length films since its opening last June 22, 2018, the CBRC Dream Theater will host its first U-Belt Short Film Festival on the 4th and 5th of August, 2018. The upcoming U-Belt Short Film Festival will be all about Pride and the LGBTQIA++ community, a belated screening after June’s Pride Month. It will feature 8 award-winning short films from all over the Metro tackling various subjects in the spectrum of society. The screening is just a kickstart for more future showcases of short films. And along with its upcoming Mano-Mano Theater Festival, the U-Belt Film Festival is not just a regular showcase of accomplished works. It also proves that the CBRC Dream Theater is a potential home for artists who need spaces to feature their work.